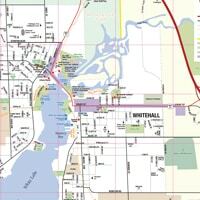 We have included some great maps to the communities of Montague and Whitehall. In addition, take a look at some of our local guides. They will give you some great ideas on what to do while you are here relaxing! Click on the map to the left to view the Click to view the Whitehall and Montague Area, and White Lake Area Map (PDF). Each White Lake area snowmobiling adventure is unique and exciting, as there are over 175 miles of maintained, interconnected snowmobile trails. Go soaring through a Michigan winter and share the experience of a Michigan snowmobiling vacation with your family and friends. It's what snowmobiling is all about. Because when natural beauty, brilliant exhilaration and good times come together, the sensation is Pure Michigan. Our snowmobile map points out places to park, find gas, lodging and dining. 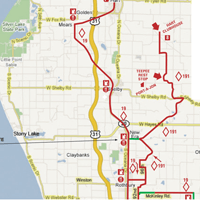 Click on the map to the left to view a full map of our area snowmobile trail map (PDF). The paved 22-mile Hart-Montague Trail State Park is one of Michigan's great rural rail-trails. The trail is located in Oceana County, the "asparagus capital of the world," and the town of Hart hosts an annual asparagus festival complete with a parade, floats, and an Asparagus Queen. Agriculture may have a hold on this area today, but Montague, Mears and Hart all have museums showcasing the time when the railroad and lumber industry reigned. The trail begins in Montague. From the trailhead in Montague there exists a connecting trail-the 4-mile White Lake Trailway-that heads south, crosses the White Lake River and continues through the City of White Hall. For the Hart Montague Trail, head north. Whichever way you go first, this is the spot to see the world's largest weathervane, a 48-foot structure depicting a Great Lakes schooner that went down in a 1901 storm. The southern segment of the trail is straight and flat. Christmas tree farms and orchards line the trail-look for cherries, peaches, apples, even apricots and plums. Be on the lookout for deer milling around in the fields and orchards, especially in the morning and evening. Springtime features a colorful and fragrant trip past the blossoming fruit trees, while autumn brings the crunch of leaves of spectacular reds, oranges, and gold. As the trail moves north through the small towns of Rothbury, New Era, Shelby, and Mears, it becomes hilly and winding. Between Rothbury and Mears there are viewing platforms with picnic tables offering scenic views of the wooded areas. The Village of New Era is near the halfway point of the trail, and during the summer trail users can stop for homemade ice cream at the trailside dairy bar. In the town of Mears, which has plenty of places to stop for food and water, you can spot remnant prairie grasses along the trail. The gently rolling terrain offers nice country vistas, with plenty of places to stop for a rest. The rail-trail winds down in Hart, but your adventure could be just heating up: Hart is the gateway to the beautiful beaches and giant sand dunes of Silver Lake and Lake Michigan. To reach the southern trailhead in Montague, take US Highway 31 north to Whitehall/Montague exit. Turn right on Bus. 31/Colby Street. Follow Business 31 past the stop light in Montague and to trailhead parking on the right. To reach the Hart area, follow US Highway 31 north and turn right onto Tyler Road/Main Street. Gurney Park and the trailhead is at the corner of Tyler and Oceans roads.